Modern wine room built with Vintage View wine racks. The customer sought a more modern/industrial look. This look was achieved with black wine racks, black glass channel, and a black evaporator faceplate. This wine storage cellar offers an interesting visual look with a mix of presentation racks and wall mounted wine racks. 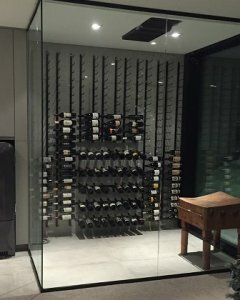 This wine room is cooled with a WhisperKool Ceiling Mount split system.